There is no shortage of decorations in stores during the holiday season; however, Princess Anne Elementary School (PAES) students looked no further than their own trashcans to deck the halls. Pizza boxes and soda cans. Bubble wrap and egg cartons. Pizza boxes, sporks and magazines? These are not your traditional holiday decorations. 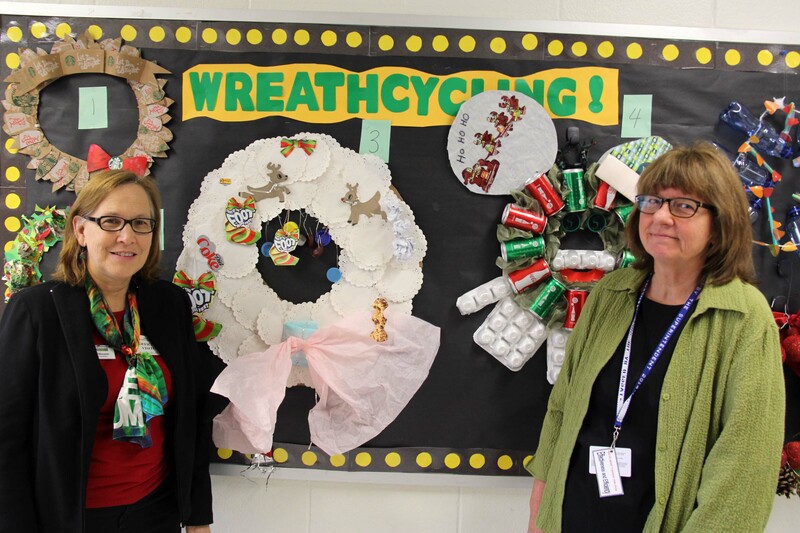 Capitalizing on the creativity of the season, PAES library media specialist Leslie Allman established a “wreathcycling” project to help students learn about sustainability as well as show their holiday spirit. 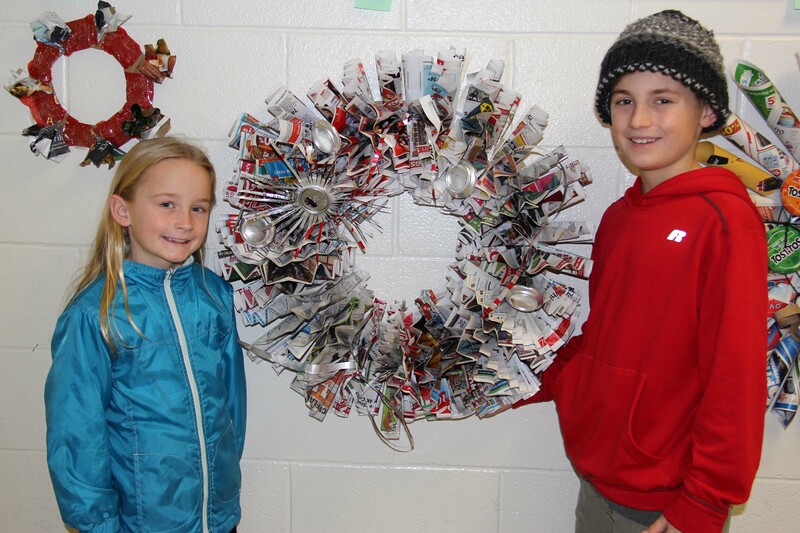 Participating students and/or classes gathered second-use materials to create holiday wreaths that were displayed in the school’s hallways. 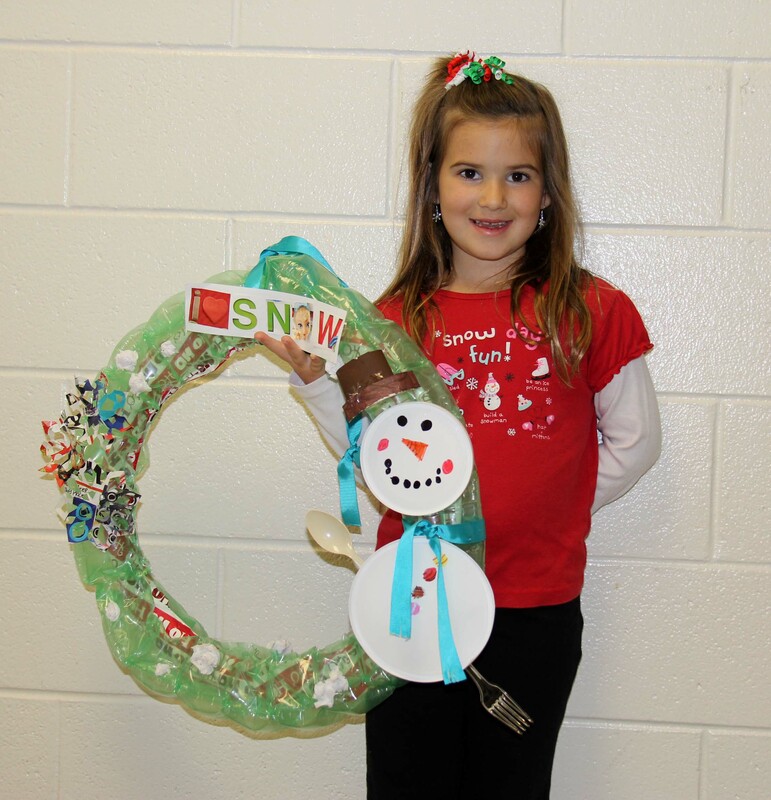 First-grader Aubrey Leggiardro’s wreath, “I Love Snow,” won a second place award for creativity. Her project was made of bubble wrap, wrapping paper, paper towel rolls, plastic utensils and lids. The next step of the wreathcycling project will be for students to research whether or not the materials used in their wreaths are a threat to the environment and if they can be replaced with more sustainable items. This research will help students produce public service announcements to share their findings. Jody Ullmann from Lynnhaven River NOW (left) and Leslie Allard (right) review several wreathcycling entries. To support these efforts, Allman was awarded a Virginia Beach Education Foundation (VBEF) Sustainability Impact Project grant. These grants support projects designed to enhance student learning of the social, economic and environmental impacts of the community’s waste stream on local watersheds. They also require a partnership with TFC Recycling, Lynnhaven River Now or the Chesapeake Bay Foundation. Jody Ullmann, Lynnhaven River NOW Education and Pearl School Coordinator, helped judge the wreaths. 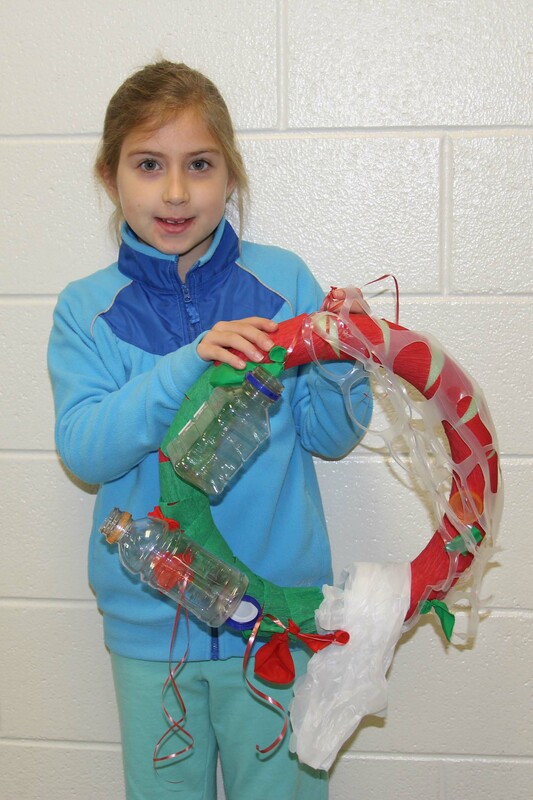 She was very impressed by second-grader Caycee Cooper’s wreath, “A Clean Christmas on the Beach,” because the items used are no longer at risk of polluting area waterways. The wreath was made with balloons, plastic rings and other trash Caycee found on the beach. Caycee Cooper’s wreath, A Clean Christmas on the Beach, won a first place award for making the “strongest statement” regarding sustainability. The Razzle Dazzle Recycling Wreath made by the Roche Family won first place in the People’s Choice category. A Diet Coke can was transformed into a star to adorn the newspaper wreath. The VBEF Sustainability Impact Project grant supporting the wreathcycling project is underwritten by Waller Todd & Sadler Architects. To view descriptions of other 2014 VBEF grant recipients and see the individuals, organizations and businesses supporting the education foundation, visit the VBEF website here. a bad idea: if you will actually use one then there is no reason not to have one.